The ten sankirtan bus parties travel year-round, throughout many different areas of India, including Assam, Odisha, Madhya Pradesh, Chhattisgarh, Jharkhand, Meghalaya, Tripura, Bihar, and all over West Bengal. Six or seven devotees travel in each bus party, as well as Their Lordships Sri Sri Gaura Nitai. Sridham Mayapur is the birthplace of the sankirtan movement, the place where Sri Chaitanya Mahaprabhu and His associates first began to broadcast the message of Krishna bhakti, and the place where their pastimes continue to go on eternally. 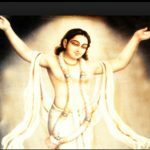 It is here that the brihat mridanga, or propagation of transcendental literature, has its heart, and the waves caused by the beating of this brihat mridanga have now spread all over the world. 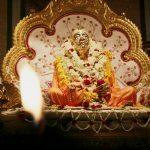 ISKCON devotees worldwide spread the teachings of Sri Chaitanya Mahaprabhu through the distribution of transcendental literature, and in the epicenter of the sankirtan movement in Sridham Mayapur, the residents of this holy place continue to do the same. Since the early days in Sri Mayapur, residents of ISKCON Mayapur have made book distribution a priority, knowing how pleasing book distribution is to Srila Prabhupada. In the 1970s, His Holiness Jayapataka Swami and other Mayapur devotees used to set out from Mayapur in a van to distribute Srila Prabhupada’s books, as well as in the Nitai Pada Kamala boat. They would travel from village to village, distributing Srila Prabhupada’s books and spreading the mercy of Sri Chaitanya Mahaprabhu. In these early days, only one of Srila Prabhupada’s books was published in Bengali: the Gitar-gan, Srila Prabhupada’s poetic translation of the Bhagavad-Gita into Bengali. 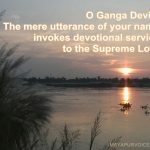 Over the years, the success of Mayapur’s book distribution and travelling sankirtan parties has continually increased, and ISKCON Mayapur now has an official Sankirtan Department which oversees all of these preaching efforts. The Sankirtan Department has only one purpose: to please Srila Prabhupada by distributing more and more of his books. And they have been incredibly successful in this regard, as ISKCON Mayapur has achieved one of the top three yearly book distribution scores every year for over ten years. For the year 2016 alone, Sridam Mayapur scored 684,775 book points. 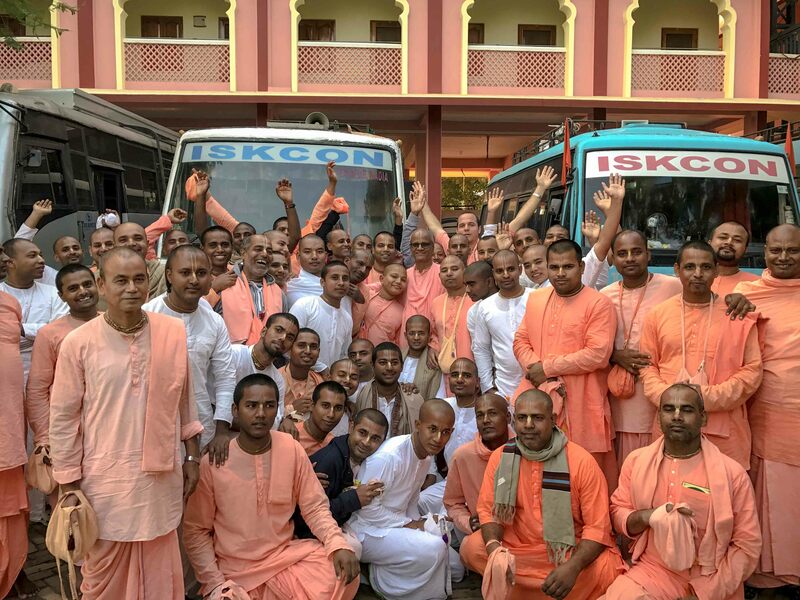 ISKCON Mayapur’s Sankirtan Department operates ten travelling sankirtan bus parties, as well as eight of the approximately twenty book tables within the ISKCON Mayapur campus. They also manage a storehouse where their many books are kept, and have a building, Sankirtan Bhavan, where most of the one hundred brahmacharis who serve within the department reside when they are in Mayapur. The book tables managed by the Sankirtan Department are an important feature of Mayapur’s preaching. Today, hundreds of thousands of visitors come to Mayapur every year – all candidates to receive Srila Prabhupada’s mercy in the form of his books! The book tables successfully introduce many of these visitors to Srila Prabhupada’s books, and have been so successful that recently an additional book table was inaugurated. A portion of the devotees who serve within the Sankirtan Department are engaged to make sure Mayapur’s visitors receive books, but the majority of the sankirtan devotees travel and preach on the ten bus parties, bringing the mercy of Sri Chaitanya Mahaprabhu to those people who do not visit Sridham Mayapur. The ten sankirtan bus parties travel year-round, throughout many different areas of India, including Assam, Odisha, Madhya Pradesh, Chhattisgarh, Jharkhand, Meghalaya, Tripura, Bihar, and all over West Bengal. Six or seven devotees travel in each bus party, as well as Their Lordships Sri Sri Gaura Nitai. Every day, the devotees rise early and perform mangal arati together, chant their japa, have darshan arati, attend Srimad Bhagavatam class, and then honor prasadam and go out to distribute books for the rest of the day. Their preaching is not without challenges. Sometimes, the devotees preach in dangerous areas. Once, while a devotee was distributing books inside of a bank, a group of dacoits entered and robbed the bank. When the police arrived, they thought that the devotee was one of the bank robbers, and arrested him! By the Lord’s mercy, everything was resolved and the devotee was set free. This is just one example of the challenges faced by the sankirtan devotees, who despite such challenges, remain unperturbed and enthusiastic in their service to Srila Prabhupada. Currently, the Sankirtan Department is preparing for their book distribution marathon, which takes place every year in December. 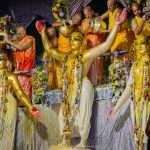 This marathon was first started in 1992 by His Holiness Jayapataka Swami and other senior devotees, and it has been incredibly successful ever since, with Mayapur scoring 251,888 book points in December of 2016. His Holiness Jayapataka Swami is a continual source of inspiration and guidance for the Sankirtan Department, and throughout the year gives much thought and time to the ongoing success of the department. 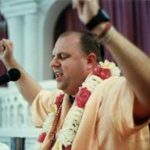 Despite the immense services he does for ISKCON worldwide, he is still regularly involved with Mayapur’s Sankirtan Department, encouraging the devotees in their service and ensuring that their service is effective and progressive. Another instrumental supporter of Mayapur’s Sankirtan Department is His Holiness Bhakti Purusottama Swami, who helped found the department and who stays with the sankirtan devotees when he is in Mayapur and offers them continual encouragement in their service. Many thanks to the devotees who serve within ISKCON Sri Mayapur’s Sankirtan Department, who are surely greatly pleasing Srila Prabhupada with their successful distribution of his books. Next articleIndia now third most trusted government in the world – What about the GDP?